Elliot Handler, creator of Hot Wheels cars and the co-founder of Mattel toys, passed away a few weeks ago at the age of 95. According to legend, Elliot wanted something that would appeal to little boys as strongly as his wife Ruth’s creation (Barbie) appealed to little girls. He found the answer in tiny race cars: Hot Wheels. According to Elliot, the difference between his cars and other small, metal cars were in the wheels. The wheels on Hot Wheels cars were designed to spin fast and go far, and that they did. I don’t know where it came from — probably a garage sale — but as a kid I had a big cardboard box full of mismatched Hot Wheels track pieces. I’d say that 95% of what I had were red, blue, and orange straight pieces, along with the little plastic tabs that allowed you to connect track pieces together. I used to spend hours in my room making tracks from one end to the other, complete with little loops and jumps for the little cars to attempt. One of my favorite cars of all time was the Red Baron. The only problem with the Red Baron was that, because it was so light, it would often sail far past any landing strip I had prepared for the cars. I remember studying every inch of that little car and wishing that someone would create a real-life version. Just think how safe it would be! Who needs seat belts when you’re sitting underneath a giant metal helmet? And who could possibly compete with the Red Baron in a head-to-head race? How about Speed Racer! 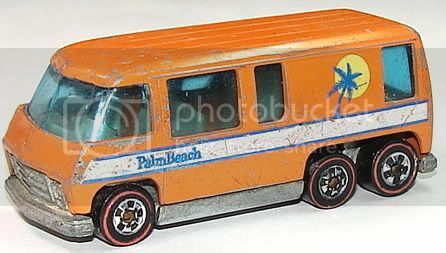 Please post pictures (or at the least the names) of some of your favorite Hot Wheels cars of all time. With 10,000+ different models to choose from, I’d like to hear which ones were your favorites! Are You Ready For Warpo’s Cthulhu Mask Contest? I only have a couple of Hot Wheels from my childhood. The Incredible Hulk van and the Red Baron. Love that car! I had the Cobra Stunt Set. Awesome track, awesome car, awesome concept. 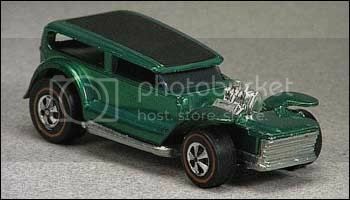 My preferred toy cars were those that bore a resemblance to beloved automotive icons of movies and tv. 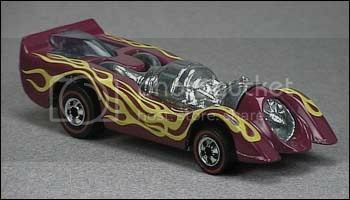 So, going through the listings on the Hot Wheels wiki I found this long-lost (and forgotten) beloved piece from my collection that brought to mind both the sporty, bone crunching abilities of Death Race 2000’s starring vehicle and something right out of Wacky Races: The Jet Threat. And this one I just loved because I could play Damnation Alley and other travel quests through desert lands, while avoiding giant rubber insects (ant, fly, the dreaded grasshopper) that threatened those foolish enough to walk the distance. living (and hiding) inside and marveling at the detailed interior. All this reminds me I had a pale blue Volkswagon Beetle that doubled as Herbie The Love Bug and also had an actual Batmobile (who didn’t?). Actually had a Bat-Copter as well, now that I think about it. Still have an old Model T car that was used for recreating The Absent-Minded Professor’s flights over the city (had to explain to fellow roadsters this car *could so* fly – but they kinda glared at me till it landed). I don’t think these were made by Hot Wheels. Would love to find images of these items. My two year old is into Hotwheels now, well any toy with wheels, but he loves the Hotwheels. So when we go to the store I always check the selection and man, they have some cool cars these days! Some are amazingly detailed too!! I forgot, the most recent one I bought was the back to The Future Delorean!!! @christopher tupa I saw the Delorean at my local grocery store and yes it was the official Back to the Future HotWheels! They also had the Ecto-1 and Christine. @Flack I still have my Red Baron…though a punk at school stomped it on the playground so the wheels have failed to turn ever since. Let me tell you about my X-Wing story on the playground someday…I can feel the tears coming already.